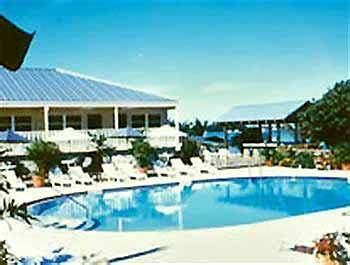 The Banana Bay Resort & Marina is one of only a few resorts in Key West that has an adults-only policy. To be more specific, you have to be at least 21 years old if you wish to stay there. This helps to make the Banana Bay Resort & Marina a great place to go for romantic escapes. It can also be an ideal retreat for adults who are simply looking to enjoy a relaxing break from everyday life. Regardless of the reason for booking a stay at the Banana Bay Resort & Marina, there will be plenty of ways to stay entertained upon arrival. For starters, this exclusive adults resort is just a short bicycle ride from renowned Duval Street and its mix of bars, cafes, restaurants, galleries, and shops. Having an adults-only policy isn’t the only way that the Banana Bay Resort & Marina distinguishes itself. It’s also one of the relatively few oceanfront hotels in Key West. Guests even have a sandy sunning beach to take advantage of. Other general amenities include a freshwater pool, a hot tub, and a Tiki Bar. Also of considerable interest are the various excursions that can be arranged at the Banana Bay Resort & Marina. These excursions include kayaking safaris, guided flats excursions, and fun-filled trips out to sea on the Dolphin in the Wild Safari snorkel boat. Shuttle service is available for a nominal fee and can be used for getting to and from Duval Street. Guests can also walk or bike to nearby shops, restaurants, trolley tours, charter fishing boats, and a variety of other things. While the Banana Bay Resort & Marina’s 34 guestrooms aren’t overly luxurious, they provide plenty in the way of comfort and amenities. Air conditioning, fridges, wet bars, and private balconies are just some of the amenities that come standard in each and every unit. For those who are interested, some of the rooms at the Banana Bay Resort & Marina have kitchenettes. Guests can also choose to book a room with either one canopy king or two double beds.